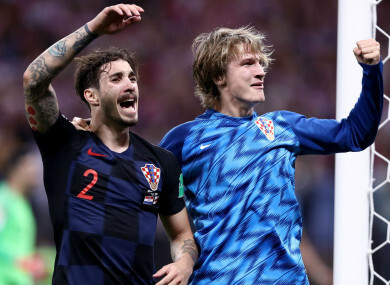 TIN JEDVAJ EXTRAORDINARY double saw Croatia blow their Nations League pool wide open with a 3-2 win against Spain on Thursday, setting up a make-or-break clash with England. The World Cup finalists endured a miserable start to their Group 4 campaign in League A – thrashed by Spain in the reverse fixture and drawing with England – but they now head to Wembley in contention for a Finals place after an incredible finish in Zagreb. Croatia beat Spain with a 93rd minute goal. A tame first half was followed by a frantic second as Croatia were twice pegged back by a rampant Spain side, Dani Ceballos levelling after Andrej Kramaric’s opener, before a Sergio Ramos penalty cancelled out Jedvaj’s first international goal. Spain, meanwhile, face a nervous wait after completing their group campaign, now requiring a draw between the two teams in London to reach next year’s knockout stage. Email “Croatia set up make-or-break showdown with England after last-gasp win over Spain”. Feedback on “Croatia set up make-or-break showdown with England after last-gasp win over Spain”.